Solid brass contract Victorian mortice door knobs. 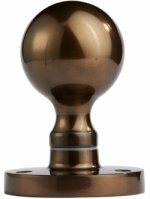 Size 52mm diameter knob on a 61mm diameter sprung back rose, supplied in pairs with spindle and fixings. 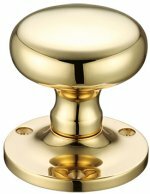 Solid brass mushroom mortice door knobs, 58mm knob diameter, 64mm rose diameter with concealed fixing in face fix or bolt through options, supplied unsprung in pairs with spindle and fixings. Available in Polished Brass, Polished Chrome, Dark Bronze & Satin Chrome. 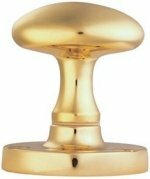 Heavy weight unsprung brass foundry mushroom door knobs by Fulton & Bray. 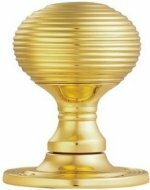 Size 58mm diameter knob, 62mm diameter back rose, 60mm projection. Supplied in pairs with follower bar and fixings. 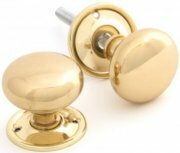 Solid brass Georgian door knobs, supplied sprung in pairs with follower bar and fixings. Door knob diameter 54mm, rose diameter 60mm. Victoria mortice door knobs. Size 55mm diameter knob on a 57mm diameter back rose, sprung on one side. 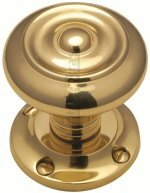 Solid brass door knobs in the Victorian period style, supplied in pairs with follower bar and fixings. Beehive reeded mortice door knobs, 55mm diameter knob, 59mm back rose, sprung on one side, 89mm projection. Supplied in pairs with follower bar and fixings. Suffolk mortice door knobs, on a 57mm diameter back rose, sprung on one side, supplied in pairs with follower bar and fixings. 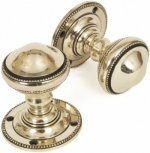 Aylesbury mortice door knobs, 57mm diameter back rose, sprung on one side, supplied in pairs with follower bar and fixings. 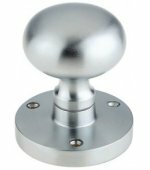 Large round mortice knob, 70mm diameter knob on 65mm back rose, supplied in pairs with follower bar and fixings. Available in Polished Brass, Polished Chrome, Satin Chrome & Florentine Bronze with concealed fixings. 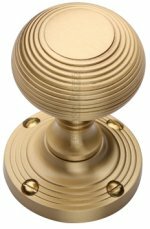 Solid brass round ball mortice door knobs, 45mm knob diameter, 61mm back rose diameter, supplied sprung in pairs with follower bar and fixings. 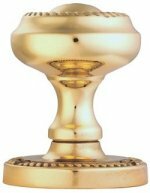 Available in Polished Brass, Polished Chrome, Satin Chrome, Dark Bronze & Satin Nickel;. Solid brass Victorian oval mortice door knobs, supplied in pairs with spindle and fixings. 55mm x 38mm knob on a 61mm sprung back rose. A solid pair of handcrafted Prestbury door knobs, popular for their weight and simplicity. The unlaquered brass achieves a timeless elegance, highly polished on all surface areas but aged to highlight the detail and design. These knobs will tarnish in time as part of the ageing process but can be polished time and time again if you want to achieve a more contemporary finish. 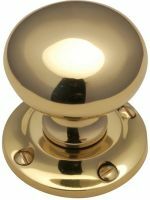 Please note this knob set is also available in Nickel if you are looking for a more Modern feel to your property. These knobs come unsprung, are hollow and have loose roses to enable them to be used with a rim lock (discard one rose) or use with a mortice lock. 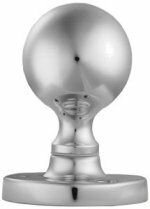 Available in 50mm diameter knob, with 64mm projection on a 50mm back rose or a 63mm diameter knob, with 71mm projection on a 63mm back rose. A very ornate and decorative pair of Tewkesbury unsprung solid door knobs, reproduced from a Georgian original. Perfectly suited to restore period properties or town houses to create a genuinely traditional feel. The Ageing process highlights the eccentric detail to the square back plate, offering a large contrast to all the highly polished components. 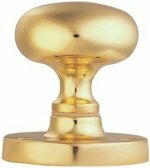 These unlacquered brass knobs will tarnish in time as part of the ageing process but can be polished time and time again if you want to achieve a high sheen. 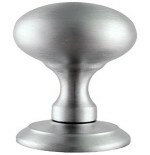 Please note this knob set is also available in Nickel if you are looking for a more Modern feel to your property. 54mm diameter knob, with 62mm projection on a 63mm square back rose. The simplicity of this design makes the door knob suitable for many property types. 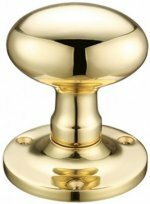 The unlaquered brass finish accentuates the small amount of detail to the knob and is highly polished for an elegant finish. 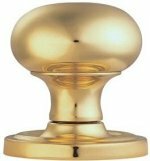 These knobs will tarnish in time as part of the ageing process but can be polished time and time again if you want to achieve a high sheen. 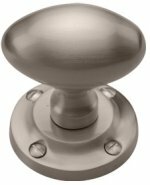 Please note this knob set is also available in Nickel if you are looking for a more Modern feel to your property. 55mm diameter knob, with 70mm projection on a 58mm back rose. A classic pair of unsprung solid mortice knobs, with fine and delicate beading to the rose and knob. A sophisticated and effortless design, accentuated by the aged brass finish. 48mm diameter knob, with 70mm projection on a 58mm back rose. 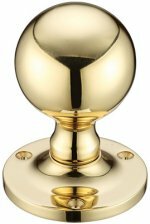 These heavy solid cast brass oval mortice/rim door knobs are designed to be used with mortice and rim locks. Supplied unsprung and unlacquered they can be polished or left to age gracefully over time developing it's own unique patina. Door knob 57mm x 40mm, projection 65mm, back rose 58mm. Unlacquered brass cottage door knobs which can be polished or left to age gracefully over time developing it's own unique patina. Available in knob diameter 49mm, on a 51mm unsprung back rose, 49mm projection, or knob diameter 57mm, on a 57mm unsprung back rose, 55mm projection. 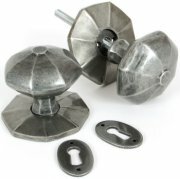 Supplied unsprung with two loose roses and spindles so can also be used as a rim door knob set. These pewter patina octagonal door knobs are unsprung, solid door knobs are not hollow and therefore have a excellent heavy quality feel. Available in either a 54mm knob with 63mm projection on a 57mm rose or a 70mm knob with 78mm projection on a 87mm rose. Dark bronze finish solid brass Victorian mushroom mortice door knobs. 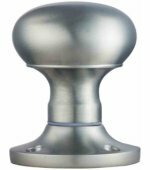 Size 52mm diameter knob on a 61mm diameter sprung back rose, supplied in pairs with follower bar and fixings. 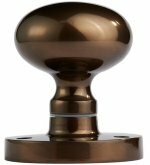 Dark bronze finish solid brass round ball mortice door knobs, 45mm knob diameter, 61mm sprung back rose diameter, supplied in pairs with follower bar and fixings. 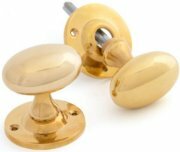 Carlisle Brass Victorian mushroom mortice door knobs, supplied in pairs with spindle and fixings. 52mm diameter knob on a 56mm unsprung back rose.